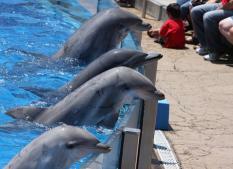 The practice of holding whales and dolphins in captivity is an increasingly controversial issue. 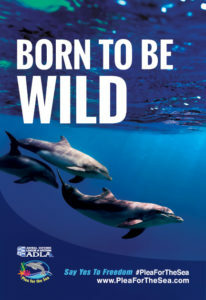 Opposition to this outdated practice has grown across the nation and around the world, fanned by the release of documentaries such as Blackfish and The Cove, and propelled by a global grassroots movement concerned with the impacts these activities have upon both captive and wild dolphins. Unfortunately, a new captive ‘Swim-with-the-Dolphins’ (SWTD) attraction has recently opened near Scottsdale, Arizona on Salt River Pima Maricopa Indian Community land. ADLA has been deeply involved in opposing this facility, called Dolphinaris, since January 2016 when the news broke that this project was moving forward. ADLA has not traditionally campaigned on dolphin issues because of our focus on local animal welfare issues (and marine mammals are not a natural part of the desert environment! ), but because of the construction of this new captive dolphin facility locally, we were compelled to act. Dolphinaris is the first of two such facilities that Mexico-based company Ventura Entertainments is seeking to build in the United States. Already, another Mexican company, Dolphin Discovery, has expanded into the US and is the largest operator in the Caribbean, profiting from the exploitation of dolphins in these captive SWTD programs. According to Courtney Vail, a local biologist and policy expert that was instrumental in alerting the public to the impending development of this captive dolphin program in Arizona, there are approximately 31 facilities in the United States holding over 560 dolphins in captivity, with at least 80% of these parks allowing some form of interaction between captive dolphins and patrons. Holding whales and dolphins in confinement for entertainment has come under intense scrutiny and global condemnation. An increasing public aversion to this practice is evidenced by a recent poll conducted here in Arizona that reveals that nearly 50% of the public opposes the confinement of dolphins to small concrete pools so that people can swim with them. Public attitudes are changing. However, despite the increasing sensitivity to holding killer whales in captivity and some progressive movements within the captivity industry to respond to changing public opinion– including the decision by SeaWorld to no longer breed or export its orcas and eliminate orca performances—there is a recent surge in the development of new SWTD programs within the United States. That is why ADLA strongly believes that our ability to challenge a new captive dolphin program here in Arizona is important to stemming this negative trend elsewhere in the United States. Here in Arizona, we are on the frontlines of the battle to fight dolphin captivity. We believe that there are many alternatives available to all of us to satisfy our desire to see, or learn about, these amazing creatures. Responsible whale and dolphin watching opportunities are not too far from our doorstep here in Arizona, where dolphins can be viewed swimming free in their natural environment. Technology, such as virtual and augmented reality, provides us with a myriad of options and potential to immerse ourselves in creative learning opportunities. Many species are appreciated, respected, and protected in their natural homes without confining them to captive environments. Through its outreach, ADLA is working to nurture and mobilize local opposition to these captive dolphin programs to prevent their establishment elsewhere, and to eliminate this practice here in Arizona. Stay tuned for more details about our campaign as we move forward in 2017. Download Captive Dolphin Fact Sheet.